Looking great in your jeans just got a little easier. 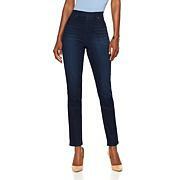 With a smoothing panel at front, The Shaper boot-cut jean might inspire an extra bit of confidence. Crafted from comfortable virtual stretch denim, they're the pair to wear when you want to look your best. This is the perfect pair of jeans for my body. Didnt have to tug at them to get them on. Theres no gaps at the waist, , and I can bend over without worrying about that back end thing. I will order another pair because I will be wearing them a lot. Love the added stretch features, pants fit like a glove & wash & wear like no other.Dog's pants are the best! These are the best Jean's I have ever worn. They're so soft and comfortable. I just love them. I won't buy jeans from anyone else, CantonOhio. Satisfy your taste for the exotic with head-turning jeans! 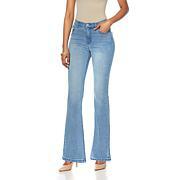 Embroidered with metallic threads and a pop of color, these boot-leg jeans look as beautiful coming as they do going. 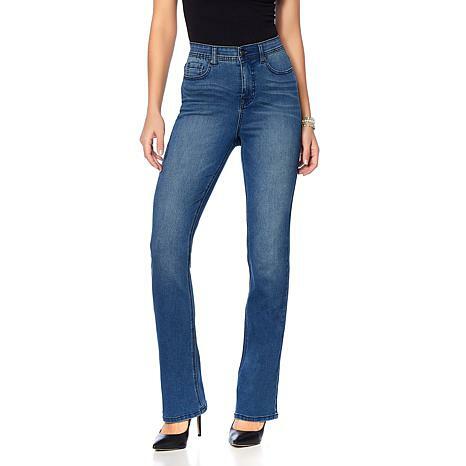 So make a grand entrance — and a memorable exit — in a very special pair of jeans you'll feel gorgeous wearing.